Createx™ Auto-Air Colors™ are the latest breakthrough in water-based, non-toxic automotive coatings technology. 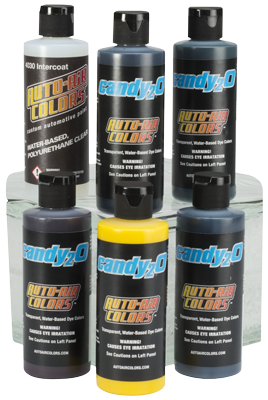 Use Auto-Air Colours to achieve brilliant, durable custom paint jobs on cars, trucks, motorcycles and helmets. New Createx™ Candy₂O are brilliant transparent colours for custom refinishing and airbrushing. Candy₂O combine advanced water-soluble, urethane resin technology with crystal-clear dyes to create truly exceptional candy colours. Candy₂O must be mixed with the new 4030 Intercoat Clear (approximately 10%). It can be reduced further with Auto-Air Reducers. Also seal with the 4030 Intercoat Clear. The Candy₂O works very well over a silver or metallic base colour, such as Auto-Air Aluminium Base or the new AutoBorne Sealer Silver. What is the difference between Candy2O and original Auto-Air Candy? The Candy₂O is a dye whereas the old Auto-Air Candy is a pigment-based, ultra-transparent paint. Candy₂O is the true water-based equivalent of popular solvent-based candy dyes. Sizes: This product is available in 4oz (120ml), 16oz (480ml) and 32oz (960ml) sizes. Click here to view all sizes. Please note that the colours shown on Airbrushes.com are a guide only.